There are books galore on the various techniques and methods of the craft of acting. John Lutterbie tries—and, for the most part, succeeds—to examine the subject from a scholarly and semi-scientific viewpoint. 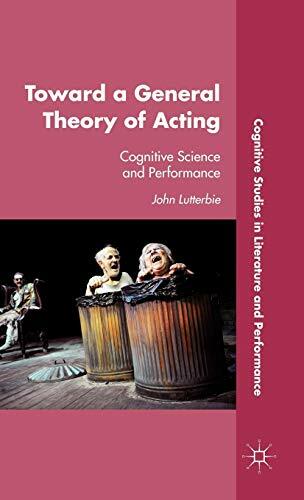 Mr. Lutterbie, who states early on that he is neither an actor nor a scientist, applies some of the concepts of cognitive behavioral theories to the rather vaguely defined art of the actor. The result is an acting book that is both valuable and informative. One of the reasons for the book’s success is the author’s willingness to seek out and listen to the artists in the field. He avoids the frequent pitfall of the academe of formulating a theory and then beating the bushes until some proof of that theory flies into his net. Mr. Lutterbie went on his search with a question in his mind. His open curiosity netted him a plethora of insights to be shared with his readers. The author studies with equal attention the personal histories of two working actors, and the published works of Stanislavski, Grotowski, Meisner, Meyerhold, and other master acting teachers. He wants to know where all these diverse theories and approaches converge and what their confluence reveals about the actor’s art. His chosen analytical tool is, as stated, the cognitive sciences and, more specifically, the Dynamic Systems Theory. Cognitive science examines the way humans process, learn, and remember information. This is obviously a key part of the actor’s process; however, the human mind is not a precisely programmable machine. The Dynamic Systems Theory is a mathematical concept that studies the seemingly unpredictable. Mr. Lutterbie’s line of attack takes him into these tangled jungles, but he doesn’t come up from his forays speaking mumbo-jumbo. Like a true explorer, he looks at every possibility, but highlights the important. He is keen on finding out why actors do what they do, how they do it, and why the results often look the same. Mr. Lutterbie’s book, with it sometimes chaotic virtual conversations between psychologists, behavioral researchers, actors, theater theoreticians (including the author), acting teachers, and such, provokes as many questions as it answers. That’s as it should be. It’s a kind of tour guide through the confusing world of acting methodologies—and it should find a home on the bookshelves of serious actors and acting teachers.